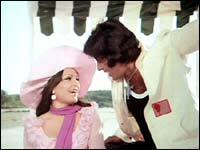 Apart from wife Jaya, Amitabh Bachchan made the maximum films with Parveen Babi. The legend looks back fondly at his association with Parveen Babi. Most of my films with Parveen were superbly successful. The audience liked us as a pair. She brought in a new, bohemian kind of leading lady to the screen. We'd work on all these films and go our own way. But because we belonged to the same social circle we'd visit each other, listen to music. She was a very fun loving, light-hearted person. Always full of joie de vivre! She never interfered with anyone's work. On the sets, you barely knew she was around. She completely minded her own business. What happened to her is really sad. I feel very bad for her. We'd meet socially very often. We all belonged to one big group -- Romesh Sharma, Danny Denzongpa, Reena Roy, Smita Patil, Javed Akhtar, Parveen. When I had my accident, they all would come to see me every single day. It was so nice of them. One never forgets the people who stick close to you at a time of crisis. I used to be very depressed at that point of time. In 1983, I took Parveen out for her first live show, and then suddenly she just disappeared! I don't really know what happened. It wouldn't be ethical to talk about her condition. The nature of her illness was such that she was terrified of people; she wanted to be left alone. She deliberately distanced herself from everyone. We felt by associating ourselves with her, we were causing her more grief. Did she make a difference to Hindi cinema? Oh, certainly! She was one of the first Indians to be featured on the cover of Time magazine. She was very meticulous about her career. She had a very efficient management system. Her secretary and managers were very efficient. She lived all on her own, and was very self-dependent. I sincerely feel she was a very genuine, honest and down-to-earth person, very loving and caring. And that's how I'd like to remember her. That definitely is not Amitabh's reaction. It looks cooked up.